Dezeen promotion: the Spanish Confederation of Wood, Confemadera, present a selection of projects by Spanish architects and designers that use wood creatively. Captions and the following text are from Confemadera:“The only way to be original is to return to our roots” – Antoni Gaudí. Wood is a rare sort of material that can inspire both cutting-edge creativity and centuries-old craftsmanship or swing between time-transcending values and the latest trends. 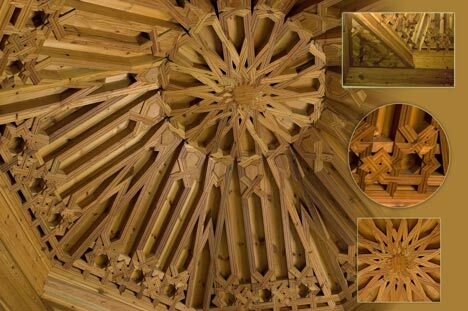 Across the board, Spanish designers, architects and artisans encapsulate all the attributes that wood has to offer, using startling originality, superb artistry and often sustainable production methods. 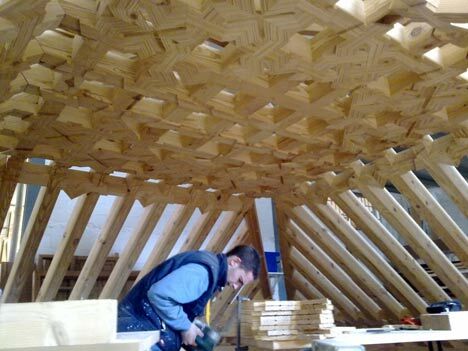 Together they are creating life-enhancing objects and structures from the oldest and noblest of materials. Above: Calvet chair by Antoni Gaudí, 1902, Produced by BD Barcelona Design. 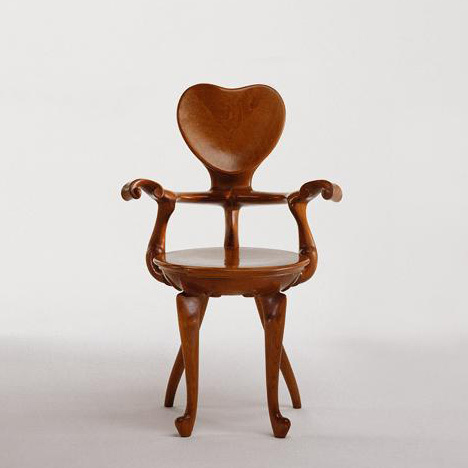 BD Barcelona Design’s cache has always included some classic masterworks, such this chair by Antoni Gaudí (1852-1926). The esteem felt by modern designers towards Gaudí’s furniture did not go unnoticed by BD Barcelona Design – the first company to rescue the designs from the vaults of history. The company embarked on producing the pieces with traditional art and craft techniques, using varnished solid oak in order to reproduce the rich detailing of the originals. 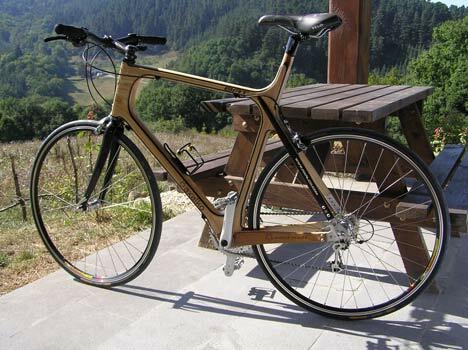 After a long period of research, the design team of the Guipúzcoa-based Axalko Company discovered that the tubular fibers of wood were perfect for creating a fast, stable bicycle frame. Wood is resistant, light and can absorb a high level of vibration, not forgetting its excellent natural aesthetic properties. Built mostly by hand and to professional standards, the bike is available in several types of wood, including the striking purple-coloured amaranth or striped zebrawood. Durable, practical and elegant, the Axalko bike sets the bar high for stylish commuting. Described as walking with ‘a thousand years of experience under your feet’, Energia Natural pavements by designer Joan Lao reflect the natural wear and tear of wood from the external elements as well as the myriad of colors and textures the material adopts. Working with wood for four decades, MH Parquets y Tarimas was founded in Guadalajara and its commitment to sustainability has been recognized and reawarded. The company’s author’s collection is under the creative direction of Joan Lao. 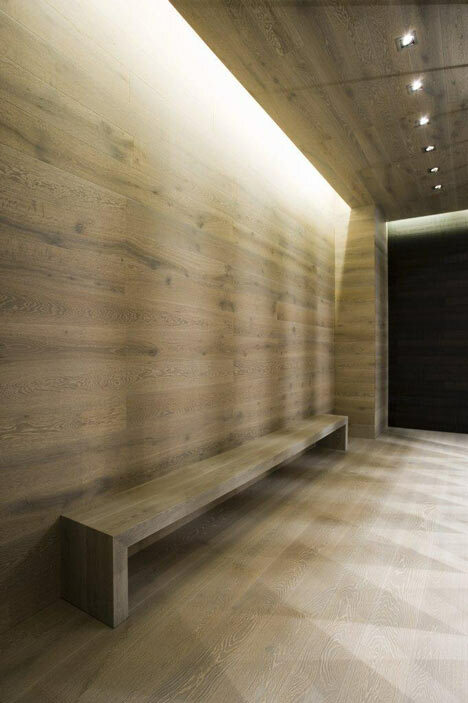 An expert in the medium of wood, Lao has taken inspiration from the Japanese wabi-sabi philosophy; the pavements denote a commitment to essential simplicity, local connection, and a sublime elegance and come in an inspired range of colours and tones. 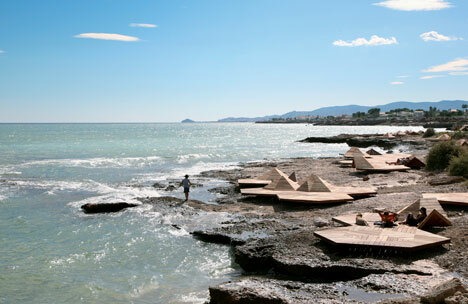 Santa&Cole is an esteemed furniture and lighting design company situated in the rural Parc de Belloch in Catalonia. Its Urban Division (which produces inspired furniture and other elements for exterior, civic use) contains a beautiful nursery of over 70 species of trees, each with a microchip implanted in its core to record growth. 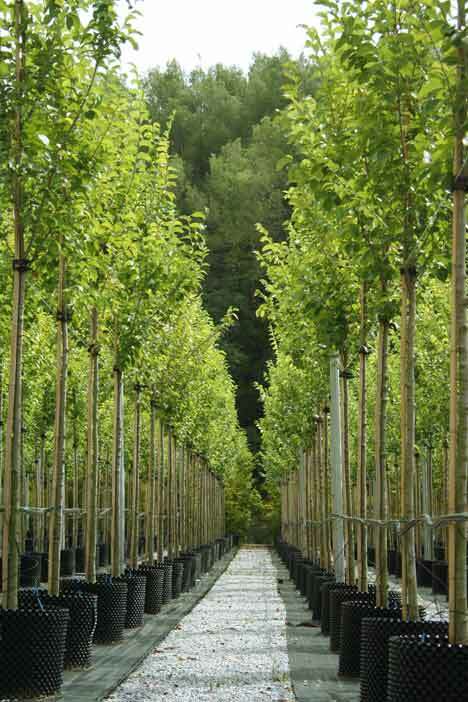 Situated 30km north of Barcelona, the Parc de Belloch is an enclave with a long tradition of nurseries as it is blessed with the ideal climatic conditions for growing Mediterranean trees, shrubs and plants. The intention was to open up a new direction for Santa&Cole, one that would not only expand the already impressive catalogue of their Urban Division, but also offer life-enhancing ‘living’ elements. Santa&Cole are concerned with contributing to a sustainable environment and cohesion between urban environments and nature. Their trees aim to provide shelter and seasonal variation as well as an organic note to our ever-expanding cities. With this venture, Santa&Cole have demonstrated the importance of natural elements in urban spaces, where trees, shrubs and plants add a refreshing constrast to the proliferance of asphalt and cement. 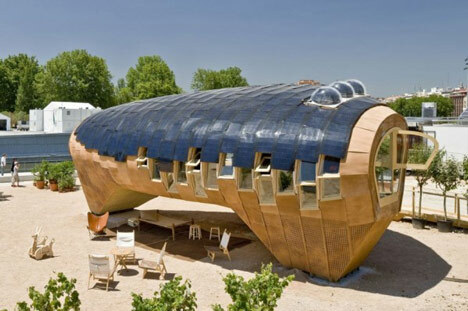 “A solar house should be made of a solar material, such as wood.” Salvador Rueda, Ecologist and Director of Barcelona’s Urban Ecology Agency. The Fab Lab House was developed by a team of people from over 25 countries under the supervision of Vicente Guallart, director of IAAC (Institute for Advanced Architecture of Catalonia). 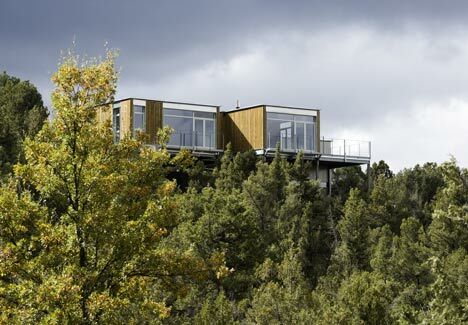 Winner of the People’s Choice Award at the 2010 Solar Decathlon Europe (held in Madrid), the structure harnesses environmental factors (sun, wind and water) and actually produces twice as much energy as it needs to function. The developers liken its organic form to a tree that captures energy with its solar ‘leaves’ and then sends it down to its ‘roots’ where it is stored and shared. 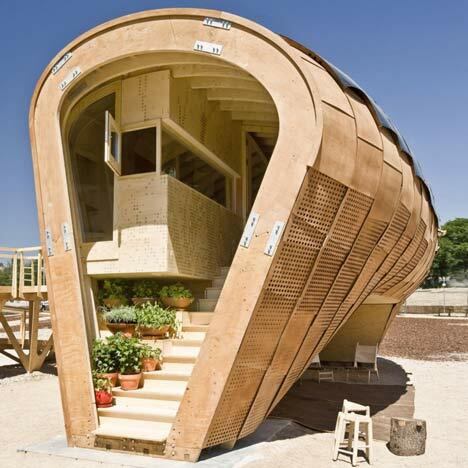 Moreover, the Fab Lab House can be built with local materials anywhere in the world. Vinaròs is a town on the Mediterranean coast of Spain about halfway between Barcelona and Valencia. The shoreline and its immediate surface area are constantly changing due to erosion and much of the coastline has been blighted by residential developments. 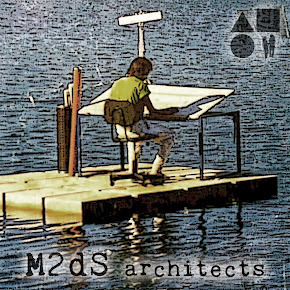 However, inspired by small-scale the beauty of the area’s inlets, coves and rock formations, architects Marta Malé and Vicente Guallart (working together with Equipamientos Gestalt) devised a series of micro-coasts, or timber islands of variable size, situated where there is rock in close proximity to the sea. This charming intervention not only ‘socializes’ the area but acts as a reminder of the original coastline, and just how much the sea has receded. The platforms are composed of two different pieces, one flat and another that can be folded, allowing people to use them in a variety of ways. If wood is synonymous with simplicity, this table is its epitome. Named La cool vie bohème, is has been created by Daniel Gantes, a young designer from Valencia. 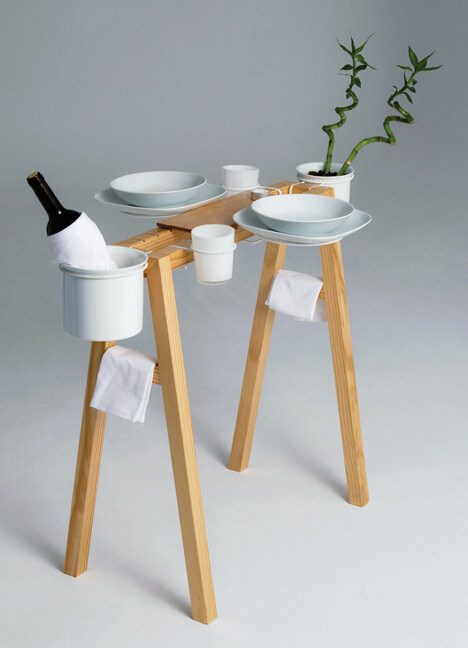 The table consists of a foldable pine stand that holds dishes, two glasses, a wine bucket and a flowerpot – the bare essentials for a romantic meal for two. Lo Siento is a Barcelona-based graphic design studio widely renowned for its three dimensional typographies. For this brand identity project, designer Borja Martinez has played with the Spanish expression 5º Pino (5th Pine tree), which expresses that something or somebody is in the back of beyond. 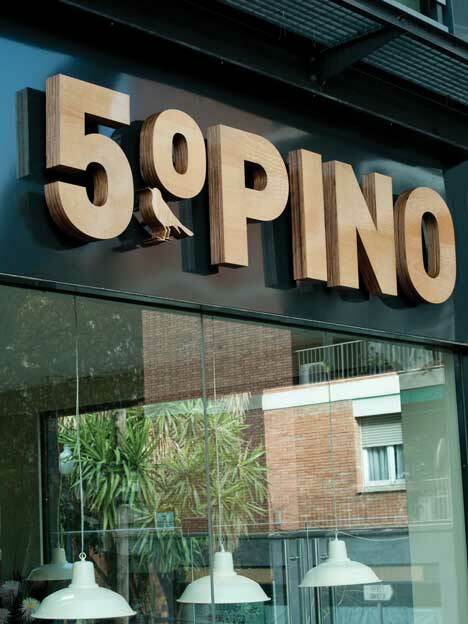 The 5º Pino bar-restaurant is located in the (not-so-isolated) district of La Bonanova in Barcelona. 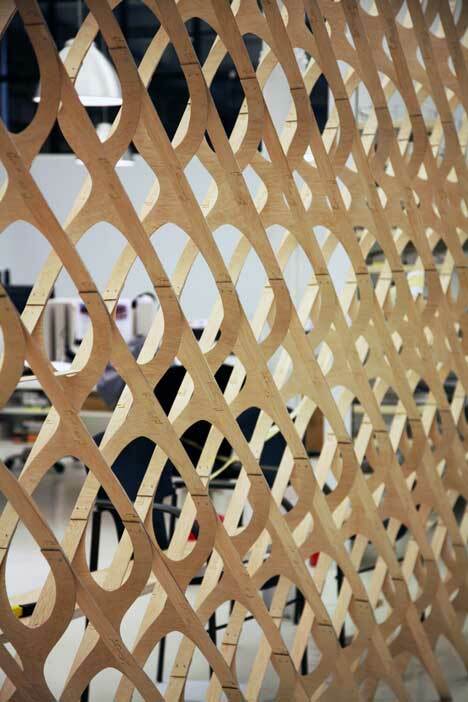 The sign for its façade has been handmade with cherry and pinewood. Calle Egurra is a street in an historic Basque village. As is the case with many ancient urbs in this part of Spain, buildings on the Calle Egurra have become very deteriorated and are fast losing their inherent beauty. 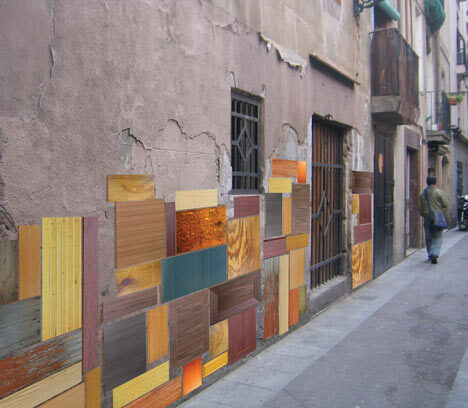 In a final year project that won a Vivir Con Madera award, three students from the Kunsthal art and design school ‘dressed’ the street’s walls with a patchwork of discarded wood and timber. They choose the material in order to maintain the historic feel of the location, and because it will be rendered with varying colors and forms over the passages of time. Cuatro50 is a housing project devised by Nuñez Ribot Architects that challenges the notion that imaginative contemporary architecture is constrained by budget and time. These homes can be custom-designed by the buyer thanks to a simple system of adjustable modules wrapped in an elegant skin of Valsain pine. 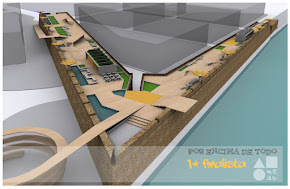 The project has been presented with a Vivir con Madera Architecture Award. Created by Estudi Borrell Architects Studio, Reach is a semi-transparent screen and space divider. It was conceived to provide visual privacy to a space when viewed from an angle while simultaneously allowing for unhampered vision when viewed straight on. The shift from opaque to transparent happens gradually as the viewer changes position, and its parametric design can be customized to fit the user’s needs. Reach has been presented with a Vivir con Madera Furniture Award. 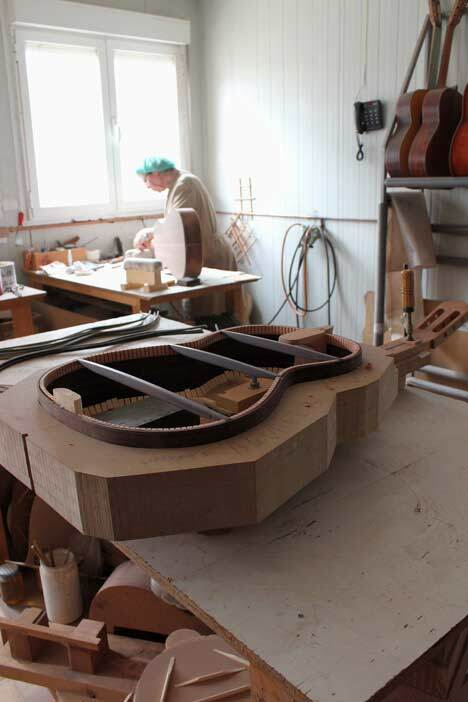 Classical guitars have been handcrafted in Casasimarro, a small town in the province of Cuenca, since the 18th century. Vicente Carrillo was born into one of the most famous of Casasimarro’s guitar-making families and his personality is embedded into each instrument he makes, reflecting one way or another the care and work placed into it. Whether he is crafting a Classical Guitar or a Flamenca, Carrillo strives for a balance between quality of sound, volume and construction. In 2010, Vicente Carrillo was awarded with the National Crafts Prize for his long and coherent trajectory and for the prestige he holds amongst famous musicians. (Artists such as Keith Richards, Mike Oldfield and Alejandro Sanz and flamenco guitarists like Tomatito or Cañizares all make music with a Carrillo guitar). His most famous work of the last seven years was the construction of guitars branded with the name Paco de Lucía – flamenco’s most revered guitarist. Guitarras Carrillois represented around the world from Japan to Australia as well as Europe, the US and China. He visto la fotografía de Vinaròs, de las "piramides " como las llamamos por aquí. Es un lugar que me encanta y al que acudo a diario para pasear y pensar. Os invito a todos lo que no conozcáis la ciudad a que la visitéis y disfrutéis de los muchos atractivos que ofrece. Felicidades por el blog, lo he descubierto hoy pero me ha encantado. Nos alegra mucho que te guste el blog! 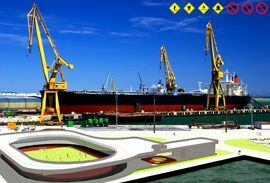 El proyecto del que hablas nos encanta aunque todavía no hemos estado por allí. Intentaremos ir ahora que empieza el buen tiempo. Gracias por la recomendación! Esperamos que sigas acompañándonos.